It is lazy to describe a game by comparing it to other ones, but it’s also terribly useful sometimes, so here goes: Below incorporates some of the most captivating elements from two of my favourite game series, Zelda and Dark Souls, and I think that’s why it has me wrapped around its little finger. It’s also visually arresting, which is another of my weaknesses. Any single screen from it would look happy in a frame on my wall. It is by far my most anticipated Xbox One game, even though there’s still a lot that’s mysterious about it. Actually, I’m probably so interested in it precisely because it’s mysterious. Below opens as you, a nameless adventurer, arrive on the shores of a quiet, still and vast island in the middle of the empty ocean, dragging a little wooden boat up onto the beach and climbing a staircase hewn into the cliffs above as rain lashes down. It’s a slow, thoughtful opening that establishes both Below’s unhurried pace and its pensive mood. Your character is a speck of life in the middle of these vast landscapes, dwarfed by nature, making their way slowly across the screen. The idea behind that, says developer Capybara Games’ Nathan Vella, is to remind you of your relative insignificance. 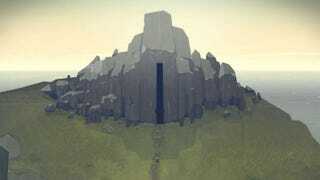 Below’s island is recognisable, but otherworldly. The pale beach, with the sheer cliffs rising up behind it, reminded me of the remote Scottish beaches my father used to drag us to when I was little (the lashing rain certainly helps with that resemblance). After scaling the stairs, there’s a gap in the rock that leads into the island’s mysterious underground caverns: these are dungeons, randomly generated and full of traps, fogged out in darkness until you start to explore them. Enemies are smears of black with glowing, red eyes. The storytelling, like Journey’s, is environmental. Later, after making it through, I find a shipwreck that has somehow ended up much further inland, with wild dogs sniffing around it; the colour palette had changed from greens and light greys to gloomier blues. The island above remains consistent, but the caverns below change with each playthrough. To me, on first impressions, Below seems to be largely about death. You’re never far from death at any point. At first entrance to the caverns, there’s a fire pit; Nathan explains that you can use it to heat your sword and cauterise your wounds, to stop the bleeding. The wanderer has a sword, a shield and a lantern, to begin with. Once the lantern runs out, you can light a torch, but that replaces your shield, Dark Souls II style. Below feels very deliberate and strategic, without the quickness of other roguelikes like Spelunky. Getting hit by pretty much anything causes you to start bleeding, so it’s a matter of time between getting hit and dying, unless you deal with it somehow. A simple crafting system lets you find plants and make poultices, or consume potions. Simple crafting. You won’t know what anything does at first. You’ll have to learn. When you do die, though—and you will, it seems, frequently—a new wanderer arrives at the island, ready to resume their forebears’ quest; perhaps years or decades or centuries later, it’s never explicit. This new adventurer might be male or female, might look or sound different to the previous one, might be mute or expressive. You can find the remains of our previous adventurer, usually with their equipment still intact, or stash things in secret places to find on your next playthrough, in case you die somewhere deep underground. Doors will still be unlocked, but if you’ve already looted somewhere, the things you found there won’t have magically returned. In this way, each playthrough forms part of the continuum of the island’s history. You’re never really starting again, just adding to the chronology. Below is out in 2015, on Xbox One and PC. I almost hope that we don’t learn anything more about it before then. I’d rather find out for myself.